Anelka began his career at Paris Saint-Germain, but soon moved to Arsenal. He became a first team regular and won the PFA Young Player of the Year Award the following season. His transfer to Real Madrid made him the world's most expensive player at £22.3 million in 1999,  but he did not settle in well and returned to PSG in a £20 million deal. Despite regular first team football in Paris, Anelka set his eyes upon the Premier League once more, moving on loan to Liverpool in January 2002, but joining Manchester City for £13 million at the start of the 2002–03 season. 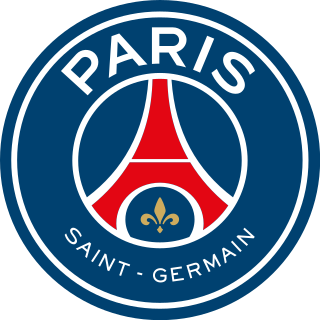 Paris Saint-Germain Football Club, commonly referred to as Paris Saint-Germain, Paris SG, or simply PSG, is a French professional football club based in Paris. Founded in 1970, the club has traditionally worn red and blue kits. PSG has played its home matches in the 47,929-capacity Parc des Princes in the 16th arrondissement of Paris since 1974. The club plays in the highest tier of French football, Ligue 1. The Professional Footballers' Association Young Player of the Year is an annual award given to the player aged 23 or under at the start of the season who is adjudged to have been the best of the season in English football. The award has been presented since the 1973–74 season and the winner is chosen by a vote amongst the members of the players' trade union, the Professional Footballers' Association (PFA). The first winner of the award was Ipswich Town defender Kevin Beattie. The current holder is Leroy Sané, who won the award for his performances throughout the 2017–18 campaign for Manchester City. After three seasons in Manchester, he moved to Fenerbahçe for two seasons before returning to England to join Bolton Wanderers in deals worth £7 million and £8 million respectively. He then transferred to Chelsea from Bolton for a reported £15 million in January 2008. In 2009 he won the Premier League Golden Boot award as the league's top goalscorer. During his transfers over the years, he has built an aggregate transfer cost of just under £90 million. On 12 December 2011, Shanghai Shenhua announced that they had reached an agreement with Anelka to join the team in the winter transfer window. After one season there, Anelka joined Italian side Juventus on a six-month loan deal in 2013, after which he was released from Shanghai and signed for West Bromwich Albion on a free transfer. Following his dismissal by West Brom, he signed for Mumbai City FC as a Marquee Player and was named player-manager in 2015. Fenerbahçe S.K., commonly known as Fenerbahçe, are a Turkish football club based in Istanbul, Turkey. The club's name comes from Fenerbahçe neighbourhood of Istanbul. The professional football department are the most notable one of Fenerbahçe SK, a major multi-sport club who compete in football, basketball, volleyball, athletics, swimming, sailing, rowing, boxing, and table tennis, among others, with many major honours won in each department. Fenerbahçe are one of the most successful and best supported football teams in Turkey, having never been relegated to lower divisions, and currently compete in the Turkish Super League and the Turkish Cup. They are nicknamed Sarı Kanaryalar and play their home games at Şükrü Saracoğlu Stadium, their own traditional home ground in Kadıköy, Istanbul. Bolton Wanderers Football Club is a professional football club in Bolton, Greater Manchester, England, which competes in the EFL Championship, the second tier of English football. The Premier League Golden Boot is an annual association football award presented to the leading goalscorer in the Premier League. 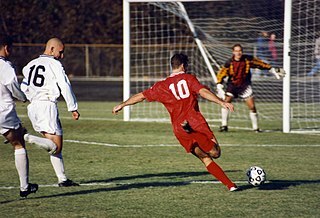 For sponsorship purposes, it was called the Carling Golden Boot from 1994 to 2001, from 2001 to 2004 as the Barclaycard Golden Boot, and the Barclays Golden Boot (2005–2016). Since 2017, it is known as the Cadbury Golden Boot. In addition to the trophy, winners of the Golden Boot are usually given £1,000 for every goal they scored throughout the season to donate to a charity of their choice, although Robin van Persie was given £30,000 after scoring 26 goals in the 2012–13 season. The 2000 UEFA European Football Championship, also known as Euro 2000, was the 11th UEFA European Championship, which is held every four years and organised by UEFA, association football's governing body in Europe. Le Chesnay is a former commune in the Yvelines department in the Île-de-France region in north-central France. On 1 January 2019, it was merged into the new commune Le Chesnay-Rocquencourt. It is located in the western suburbs of Paris, 16.7 km (10.4 mi) from the center of Paris. Yvelines is a department in the region of Île-de-France, France. Located west of Hauts-de-Seine, it had a population of 1,431,808 as of 2016. Its main cities are Versailles, Saint-Germain-en-Laye, Mantes-la-Jolie and Rambouillet. Martinique is an insular region of France located in the Lesser Antilles of the West Indies in the eastern Caribbean Sea, with a land area of 1,128 square kilometres (436 sq mi) and a population of 376,480 inhabitants as of January 2016. Like Guadeloupe, it is an overseas region of France, consisting of a single overseas department. 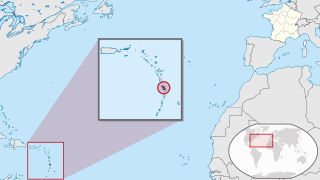 One of the Windward Islands, it is directly north of Saint Lucia, southeast of Greater Antilles, northwest of Barbados, and south of Dominica. 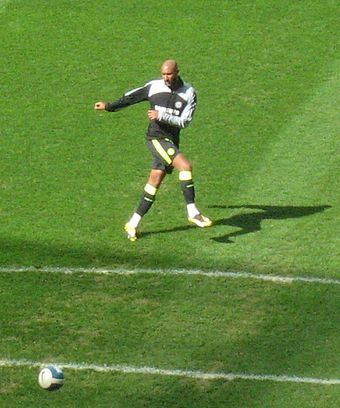 Anelka is married to Barbara Tausia, a Belgian choreographer. Together, they have two sons, Kais born in 2008 and Kahil born in 2010. He acted in the 2002 film Le Boulet as a footballer named Nicolas. He has said that when he retires from football, he would like to work in the film industry because he has a friend in the business. He said, "I have a friend who's a producer, who makes lots of films. He recently did Astérix. So it's already agreed that I'm going to do other films. It helps to know actors and producers. It's different to football and it's something I enjoy very much because there's no ball. I like pretending to be somebody else, it's fun." Barbara Anelka Tausia is a Belgian choreographer and dancer. She is the wife of French footballer Nicolas Anelka and has followed her husband around Europe as he has changed teams. Le Boulet is a French film directed by Alain Berbérian and Frédéric Forestier, released in 2002. In February 1997, at age 17, Anelka joined Premier League club Arsenal for a £500,000 transfer fee  under newly appointed manager Arsène Wenger. His first team opportunities were limited in the 1996–97 season, but in 1997–98, he broke into the first team after a long-term injury to striker Ian Wright. In November 1997, Anelka scored his first goal for Arsenal in a 3–2 home win against Manchester United. Anelka was a key player in Arsenal's Double win of both the Premier League and FA Cup that season. Anelka scored the second goal in Arsenal's 2–0 win over Newcastle United in that season's FA Cup final. However, once again Anelka developed issues with his head coach, Luis Fernández (who was already under pressure for benching Ronaldinho due to his work ethic). In January 2005, Manchester City announced Anelka had completed a £7 million transfer to Turkish team Fenerbahçe. Anelka helped the Turkish club win the Süper Lig title in 2005,  and played with them in the UEFA Cup that season, as well as the UEFA Champions League the season after. On 25 August 2006, Bolton Wanderers signed Anelka on a four-year deal for a club record transfer fee of £8 million. He made his debut for Bolton against Watford on 9 September 2006. He opened his account on 19 September in a League Cup match against Walsall, scoring the last goal of a 3–1 away win. After 11 matches without a goal in the Premier League, he scored his first goals – a brace – on 25 November to help down Arsenal 3–1. He finished the 2006–07 Premier League season as Bolton's top scorer with ten goals. Anelka scored his first goal of the 2009–10 season against West London rivals Fulham in a 2–0 win at Craven Cottage, before continuing his fine form with the opening goal in Chelsea's 3–0 win over Burnley the following weekend. He scored his third goal of the season in the opening match of the 2009–10 Champions League group stage in the 1–0 victory over Porto. Anelka scored one of the best goals of his season against APOEL in the Champions League with the ball being passed into the net from outside the box. Anelka scored his third league goal of the season against Liverpool at Stamford Bridge in a 2–0 win with the second goal coming from compatriot Florent Malouda. Anelka continued his fine scoring run in the Champions League with the winner in the 1–0 victory over Porto at the Estádio do Dragão, making Chelsea only the second ever English side to win at Porto's home ground. He continued his scoring in the season by scoring Chelsea's first goal in a 3–3 draw against Everton in the Premier League, his first goal in the competition since October. He followed that up with another goal in Chelsea's 2–1 victory over Portsmouth. Anelka started the 2010–11 campaign in fine form for Chelsea. He assisted Florent Malouda's last goal against West Brom on the opening day of the Premier League season, scored a double in the next game against Wigan Athletic, then won a penalty against Stoke City in Chelsea's third game of the season. He continued this fine form in Chelsea's first Champions League match, scoring a first half brace against MŠK Žilina. Further goals against Marseille and Spartak Moscow ensured this was the first season since playing for Paris Saint-Germain he had scored at least four goals in a Champions League season. On 19 October, during Chelsea's Champions League group stage match against Spartak, Anelka continued his impressive goal scoring form in the Champions League, scoring the second goal of the match and his 50th goal for Chelsea in the 43rd minute of the game. He ended the 2010–11 season with 16 goals from 45 appearances in all competitions. Anelka played with Giovanni Moreno and his former Chelsea teammate Didier Drogba at Shanghai Shenhua. On 26 January 2013, Anelka joined Italian side Juventus on a five-month loan deal. He made his debut for Juventus against Celtic in the Champions League. Anelka made two further appearances for Juventus, both in Serie A, as the club won the league title. On 4 July 2013, Anelka joined West Bromwich Albion on a free transfer after being released by Shanghai Shenhua, marking another return to the Premier League, the sixth Premier League club he has played for in his career. He said he would like to end his career in England, at West Brom. On 22 August 2013, Anelka reportedly walked out of a training session telling staff he was leaving the club to retire. The reports were quickly denied by the club, which confirmed Anelka would miss one match and that he had left the session early on compassionate grounds following the death of his agent. On 28 August 2013, it was announced that since completing his week of compassionate leave, Anelka had decided to remain with the club and would begin training the following day in preparation for West Brom's forthcoming match against Swansea City. He subsequently returned full-time to the team. Anelka scored his first goal for the club in a 3–3 draw with West Ham United on 28 December 2013, scoring a first-half brace in his first appearance in over two months. During his goal celebration he performed a quenelle , a hand gesture popularized by his comedian friend Dieudonné, an inverted Nazi salute. The Football Association (FA) and anti-racism organisations investigated the incident following allegations of anti-Semitism. On 27 February 2014, an FA disciplinary hearing banned Anelka for five matches, fined him £80,000 and ordered him to complete an educational course. In the hearing, the FA disciplinary hearing panel concluded, "[W]e did not find that Nicolas Anelka is an anti-Semite or that he intended to express or promote anti-Semitism by his use of the quenelle." Anelka and the FA both decided not to appeal this verdict. On 15 September 2014, Anelka joined Mumbai City of the newly formed Indian Super League. Following a three-match global ban, he made his debut on 28 October 2014 in a 5–1 defeat at Chennaiyin FC. Five days later, in his first home match at the DY Patil Stadium, Anelka scored the match's only goal to defeat Kerala Blasters. On 5 November, he scored his only other goal of the season, for a home game of the same outcome against the Delhi Dynamos. Anelka played a total of seven matches for Mumbai, as they finished seventh and did not qualify for the end-of-season play-offs. Anelka came on as a substitute in the Euro 2008 qualifier against Lithuania on 24 March 2007, and scored the only goal in a 1–0 victory. Following his performance, Anelka was praised by France manager Raymond Domenech: "It is the Nicolas I like to see... when he shows these qualities, he is a candidate for a permanent place." He also scored in the 2–0 victory against Ukraine on 2 June 2007. The 2002–03 FA Premier League was the 11th season of the Premier League, the top division in English football. The first matches were played on 17 August 2002 and the last were played on 11 May 2003. Joseph John Cole is an English football coach and former professional footballer who played as an attacking midfielder or winger in the Premier League, Ligue 1, League One and United Soccer League. Petr Čech is a Czech professional footballer who plays as a goalkeeper for Premier League club Arsenal. Gareth Barry is an English professional footballer who plays as a midfielder for EFL Championship club West Bromwich Albion. A former England international, Barry has made 653 Premier League appearances for Aston Villa, Manchester City, Everton and West Bromwich Albion, the highest number of appearances in the Premier League. William Eric Gallas is a French retired footballer who played as a defender. He played most of his footballing career in France and England before finishing his career in Australia with A-League club Perth Glory. 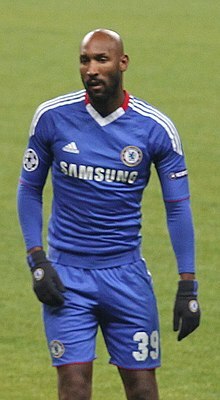 Gallas began his career in France, before being signed by English club Chelsea in 2001. He transferred to rivals Arsenal as part of an exchange deal in 2006. He then signed for Tottenham Hotspur in 2010. Gary James Cahill is an English professional footballer who plays as a centre back for Premier League club Chelsea, where he is also club captain. Christopher Wreh is a retired Liberian international footballer who played as a striker. He was a member of the Arsenal side which won the Premier League and FA Cup double during the 1997–98 season. Florent Johan Malouda is a French Guianese football coach and former professional player. Daniel Andre Sturridge is an English professional footballer who plays as a striker for Premier League club Liverpool and the English national team. The 2006–07 FA Premier League was the 15th season of the FA Premier League since its establishment in 1992. The season started on 19 August 2006 and concluded on 13 May 2007. On 12 February 2007, the FA Premier League renamed itself simply the Premier League, complete with new logo, sleeve patches and typeface. The sponsored name remains the Barclays Premier League. The 2008–09 season was Chelsea Football Club's 95th competitive season, 17th consecutive season in the Premier League and 103rd year in existence as a football club. Jack Andrew Garry Wilshere is an English professional footballer who plays as a midfielder for Premier League club West Ham United and the English national team. The 2009–10 season was Chelsea Football Club's 96th competitive season, 18th consecutive season in the Premier League, 104th year in existence as a football club and their first season coached by Carlo Ancelotti. Despite disappointment in the Champions League going out to eventual winners Inter Millan in the round of 16, the club had the most successful season in its history, winning the Premier League for a third time and retaining the FA Cup for the first time, thus becoming the seventh English club to complete the "Double". Tomáš Rosický is a Czech former professional footballer who was the captain of the Czech Republic national team for a ten-year period. He played club football for Sparta Prague, Borussia Dortmund and Arsenal. He was nicknamed "the little Mozart" for his ability to "orchestrate" the midfield. The 2013–14 season was West Bromwich Albion's fourth consecutive season in the Premier League, their eighth in total. During the season, they also competed in the League Cup and the FA Cup. Robert Samuel Holding is an English professional footballer who plays as a centre back for Premier League club Arsenal. ↑ "Player Profiles". West Bromwich Albion F.C. Archived from the original on 25 December 2013. ↑ "Chelsea complete £15m Anelka deal". BBC Sport. 11 January 2008. Retrieved 30 July 2016. ↑ "Ancelotti: Anelka has it all". Chelsea FC. 31 October 2009. Archived from the original on 24 May 2014. ↑ "Classy Anelka rubs salt in wounds as Bolton stun United". Daily Mail.co.uk. ↑ "Top 30 most expensive players of all time - who have built up largest cumulative transfer fees?". The Daily Telegraph . 3 August 2017. ↑ "Nicolas Anelka second most expensive player ever". Box Office Football. 31 August 2009. Archived from the original on 16 April 2010. Retrieved 3 May 2010. ↑ "Anelka deal agreed". Sky Sports. 7 December 2011. ↑ "Communiqué de la Fédération" (in French). FFF. 19 June 2010. Archived from the original on 15 September 2012. Retrieved 24 May 2014. ↑ Burt, Jason (17 August 2010). "Nicolas Anelka banned for 18 games by France after World Cup disgrace". The Daily Telegraph . London. ↑ "Nicolas Anelka laughs at 'nonsense' 18-match French ban". BBC Sport. Retrieved 9 October 2016. ↑ "Nicolas Anelka haunts old coach as Bolton beats Arsenal". The New York Times. 26 November 2006. ↑ "One-on-One with Nicolas Anelka" Archived 28 August 2008 at the Wayback Machine . FourFourTwo Retrieved 8 January 2012. ↑ "Nicolas Anelka: de Trappes à Wembley" [ permanent dead link ] (in French). Le Point. 20 February 1999. ↑ Bryant, Tom (24 October 2007). "Has a journalist ever won an international cap?". The Guardian. London. Retrieved 20 May 2010. ↑ Din, Tusdiq (23 August 2011). "Fasting and football. How do top-flight Muslims cope?". London: The Independent . Retrieved 1 January 2013. 1 2 3 4 "Nicolas Anelka: West Brom striker defends goal celebration". BBC. Retrieved 31 December 2013. 1 2 "Nicolas Anelka banned and fined £80,000 for 'quenelle' gesture". BBC Sport . 27 February 2014. Retrieved 28 February 2014. ↑ "Albion update on Anelka Contract". West Bromwich Albion F.C. 14 March 2014. Retrieved 15 March 2014. ↑ "Nicolas Anelka joins Mumbai City in Indian Super League". sports-nova.com. Retrieved 15 September 2014. ↑ "Paris Saint-Germain will always be 'my club', admits Nicolas Anelka". Daily Mail.co.uk. ↑ "Number 9 Nicolas Anelka". Arseweb. Retrieved 24 August 2007. ↑ "Nicolas Anelka Bio". ESPN Soccernet. Retrieved 9 July 2007. ↑ "Games played by Nicolas Anelka in 1997/1998". Soccerbase. Centurycomm. Retrieved 24 May 2014. ↑ "Anelka – I'm no 'Le Sulk'". Sky Sports. 25 November 2008. Retrieved 29 November 2008. ↑ "Anelka: The story so far ..." BBC. 2 August 1999. Retrieved 29 June 2013. ↑ "Suker replaces Anelka at Arsenal". BBC. 2 August 1999. Retrieved 29 June 2013. 1 2 "Greatest 50 Players – 29. Nicolas Anelka". Arsenal.com. 1 2 "Nicolas Anelka". Arsenal.com. Archived from the original on 5 March 2017. 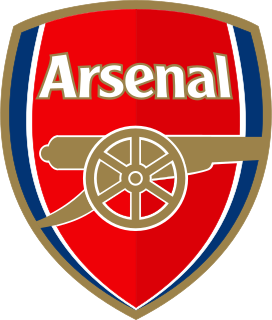 ↑ "Nicholas Anelka slams Wenger haters". Get Football News France.com. ↑ "Nicolas Anelka". Football-Heroes. Retrieved 24 May 2014. ↑ "Anelka finally opens account". BBC. 5 January 2000. ↑ "Anelka doubles up but then pays the penalty for Real". The Guardian. 9 January 2000. ↑ "Anelka proves the Real deal". The Guardian. 29 February 2000. ↑ "Anelka: 'They treat me like a dog'". BBC. 14 March 2000. ↑ "Apology Behind Him, Real Madrid's Forward Helps Break Bayern : A Goal Returns Anelka to Favor". International Herald Tribune . Archived from the original on 4 December 2008. Retrieved 14 January 2008. ↑ "Real Madrid 2–0 Bayern Munich". The Guardian. 4 May 2000. ↑ "Bayern Munich 2–1 Real Madrid". The Guardian. 10 May 2000. ↑ "Anelka sparks Real celebrations". BBC Sport . 3 May 2000. Retrieved 16 April 2012. ↑ "Anelka seals Real's final ticket". BBC Sport. 9 May 2000. Retrieved 16 April 2012. ↑ "Real Madrid 3–0 Valencia". The Guardian. 25 May 2000. ↑ "Nicolas Anelka factfile". Metro . 11 January 2008. ↑ "Anelka set to return home in £20 Million Deal". The Guardian . 11 July 2000. ↑ "Liverpool take a gamble on Anelka". The Guardian . 22 December 2001. ↑ "2000–01". Paris St. Germain. 19 May 2013. ↑ "Everton hold Liverpool". BBC Sport. 23 February 2002. Retrieved 27 August 2009. ↑ "Liverpool see off Fulham". BBC Sport. 2 March 2002. Retrieved 27 August 2009. ↑ "Liverpool win Rovers thriller". BBC Sport. 8 May 2002. Retrieved 27 August 2009. ↑ "Rampant Reds sink Ipswich". BBC Sport. 11 May 2002. Retrieved 27 August 2009. ↑ "Liverpool cruise through". BBC Sport. 5 January 2002. Retrieved 27 August 2009. ↑ "Houllier: No Anelka regrets". BBC Sport. 4 January 2003. ↑ "Anelka agrees Man City move". BBC Sport. 24 May 2002. Retrieved 10 September 2011. ↑ "Man City 1–0 Chelsea". BBC Sport . 16 October 2004. ↑ "Anelka completes Fenerbahce move". BBC Sport. 31 January 2005. Retrieved 30 July 2007. ↑ "Fenerbahce Istanbul – Süper Lig 2004/2005 – Fussballdaten – Die Fußballdatenbank". Archived from the original on 6 April 2016. Retrieved 26 March 2016. ↑ "Bolton sign Anelka in record deal". BBC Sport. 25 August 2006. Retrieved 9 July 2007. ↑ "Allardyce buoyed by Anelka debut". BBC Sport. 11 September 2006. Retrieved 9 July 2007. ↑ "Walsall 1–3 Bolton". BBC Sport . 19 September 2006. Retrieved 22 March 2014. ↑ Sanghera, Mandeep (25 November 2006). "Bolton 3–1 Arsenal". BBC Sport . Retrieved 22 March 2014. ↑ "Anelka's Wenger admiration". Sky Sports. 23 January 2007. Retrieved 24 May 2014. ↑ "Anelka makes commitment to Bolton". BBC Sport. 9 July 2007. Retrieved 9 July 2007. ↑ "Bolton form may mean Anelka exit". BBC Sport. 25 August 2007. Retrieved 25 August 2007. ↑ "Anelka signs new deal with Bolton". BBC Sport. 30 August 2007. Retrieved 30 August 2007. ↑ Bryant, Tom (11 January 2008). "Chelsea capture £15m Anelka". London: guardian.co.uk. ↑ "Anelka shines as Chelsea win". Eye Football. 12 January 2008. ↑ "Nicolas Anelka". Soccerbase. Archived from the original on 4 June 2012. Retrieved 9 July 2007. ↑ Nakrani, Sachin; Hytner, David (23 May 2008). "Anelka blames miss on lack of warm-up to put more heat on Grant". guardian.co.uk. ↑ "Chelsea rout sorry Milan". Sky Sports . 3 August 2008. Retrieved 22 March 2014. ↑ "Anelka win Barclays Golden Boot Award". Premier League. 14 November 2008. Archived from the original on 25 May 2014. ↑ Bevan, Chris (1 November 2008). "Chelsea 5–0 Sunderland". BBC Sport. Retrieved 3 May 2010. ↑ Dominic Fifield (16 February 2009). "FA Cup: Watford 1–3 Chelsea". The Guardian. UK. Retrieved 3 May 2010. ↑ "Anelka: I still love Arsenal". Four Four Two.com. ↑ "Sunderland 2–3 Chelsea". BBC Sport. 24 May 2009. ↑ McNulty, Phil (15 September 2009). "Chelsea 1–0 F.C. Porto". BBC Sport. Retrieved 3 May 2010. ↑ McNulty, Phil (4 October 2009). "Chelsea 2–0 Liverpool". BBC Sport. Retrieved 3 May 2010. ↑ Dawkes, Phil (12 December 2009). "Chelsea 3–3 Everton". BBC Sport. Retrieved 3 May 2010. ↑ Lyon, Sam (16 January 2010). "Chelsea 7–2 Sunderland". BBC Sport. Retrieved 3 May 2010. ↑ Fifield, Dominic (13 April 2010). "Nicolas Anelka strikes as Chelsea beat Bolton and extend lead at summit". The Guardian. London. Retrieved 21 October 2010. ↑ "Anelka signs new Chelsea contract". BBC Sport. 24 June 2010. ↑ "Nicolas Anelka and Alex submit Chelsea transfer requests". BBC Sport. 3 December 2011. Retrieved 11 December 2011. ↑ Gray, Ashley (9 December 2011). "Anelka deal a Chinese cracker as Chelsea striker nets £200,000 a week with Shanghai Shenhua". Daily Mail. London. Retrieved 10 December 2011. ↑ 申花宣布签约阿内尔卡两年 朱骏微博晒合影表欢迎 (in Chinese). sina. 12 December 2011. Retrieved 12 December 2011. ↑ 转会快讯：法国前锋阿内尔卡冬季正式加盟上海申花 (in Chinese). Shenhuafc. 12 December 2011. Retrieved 12 December 2011. ↑ "Anelka move agreed". chelseafc. 12 December 2011. Archived from the original on 1 July 2013. Retrieved 24 May 2014. ↑ "Anelka lifts the lid on his spectacular fall-out with Chelsea manager Villa-Boas". Daily Mail. London. 8 February 2012. Retrieved 18 May 2012. ↑ "Torres, Matic & Chelsea's January hits and misses". Goal.com. ↑ "Que les gros salaires lèvent le doigt" (in French). Eurosport. Archived from the original on 19 July 2012. Retrieved 19 July 2012. ↑ "I Could Have Moved to Paris Saint-Germain: Former Chelsea Striker Nicolas Anelka On January Choice". Inside Futbol. 6 February 2012. Retrieved 6 February 2012. ↑ "Anelka fails to make Shanghai Shenhua debut due to ankle injury". Goal.com. 10 March 2012. Retrieved 17 March 2012. ↑ "Nicolas Anelka scores in Shanghai Shenhua debut". Goal.com. 16 March 2012. Retrieved 17 March 2012. ↑ "Nicolas Anelka added to Shanghai Shenhua coaching staff". ESPN FC . 12 April 2012. Retrieved 3 January 2013. ↑ "Drogba confirms Shanghai move". Sky Sports . 19 June 2012. Retrieved 23 June 2012. ↑ "Nicolas Anelka seeks Premier League return as China adventure turns sour". Metro . 6 July 2012. ↑ "African goalscorers in Europe & China August 25–26". BBC Sport. 27 August 2012. ↑ "Former Chelsea strikers Didier Drogba and Nicolas Anelka could be sold by Shanghai Shenhua". The Independent . London. 28 August 2012. ↑ "Anelka signs for Juventus to aid 'emergency' situation in attack". London: Daily Mail. 26 January 2013. Retrieved 26 January 2013. ↑ "I 5 campioni d'Italia che non-ricordi [The 5 champions of Italy who you don't remember]". Eurosport . 6 May 2013. ↑ "Albion seal Anelka deal". West Bromwich Albion F.C. 4 July 2013. ↑ "Nicolas Anelka: West Brom signing hopes to retire in England". BBC Sport. Retrieved 26 March 2016. ↑ "Premier League: West Brom rule out Nicolas Anelka amid retirement reports". Sky Sports. ↑ "Nicolas Anelka: West Brom striker returning to club duty". BBC Sport. Retrieved 26 March 2016. ↑ "Nicolas Anelka announces he has left West Brom". ITV News. Retrieved 26 March 2016. ↑ "Anelka claims he's terminated his contract with West Brom after failing to appeal five-game ban for quenelle gesture". Daily Mail. London. ↑ "Albion update on Anelka contract" . Retrieved 26 March 2016. ↑ "West Brom sack Nicolas Anelka for 'gross misconduct'". BBC Sport. Retrieved 26 March 2016. ↑ "Nicolas Anelka joins Mumbai City". sports-nova.com. 15 September 2014. ↑ "Nicolas Anelka joins Indian Super League side Mumbai City". BBC Sport. 15 September 2014. Retrieved 15 September 2014. ↑ Suchindran, Aravind (28 October 2014). "Elano, Mendoza shine as Chennai trounce Mumbai 5–1". The Times of India . Retrieved 31 October 2014. ↑ "ISL: Anelka strike helps Mumbai edge past Kerala". The Times of India. 2 November 2014. Retrieved 14 December 2014. ↑ Netto, Brendon (5 November 2014). "Mumbai City FC 1–0 Delhi Dynamos FC: Anelka again the difference as Mumbai record second consecutive win". Goal.com. Retrieved 14 December 2014. ↑ "Transfer news: Nicolas Anelka misses out on Algerian move due to his age". Sky Sports. 12 January 2015. Retrieved 19 January 2015. ↑ "Nicolas Anelka named Mumbai City player-manager". BBC Sport. 3 July 2015. Retrieved 3 July 2015. ↑ "France v Andorra". 11v11. 14 October 1998. ↑ "Nicolas Anelka factfile". ITV Sport. 20 June 2010. Archived from the original on 24 June 2010. ↑ "Enigmatic Nicolas Anelka out to make his World Cup debut a winning one with France". London: Daily Mail. 26 May 2010. ↑ "UEFA profile". UEFA . Retrieved 20 July 2011. ↑ "Broken leg agony for Djibril". Metro . DMG Media. 8 June 2006. Retrieved 17 August 2017. ↑ "Ronaldo rejoices". Daily Express. 26 March 2007. ↑ "Final squads announced for EURO". UEFA Euro 2008. 28 May 2008. Archived from the original on 5 January 2013. ↑ "Canny Romania leave France frustrated". UEFA Euro 2008. Archived from the original on 11 July 2012. Retrieved 18 June 2008. ↑ "Dominant Dutch progress in style". UEFA Euro 2008. Archived from the original on 24 May 2010. Retrieved 18 June 2008. ↑ "France sunk as Italy grab lifeline". UEFA Euro 2008. Archived from the original on 16 November 2013. Retrieved 18 June 2008. ↑ "Republic of Ireland 0–1 France". BBC Sport. 14 November 2009. Retrieved 16 November 2009. ↑ Dawkes, Phil (17 June 2010). "France 0–2 Mexico". BBC Sport. Retrieved 19 June 2010. ↑ Fagot, Vincent (19 June 2010). "Anelka, une petite Coupe et puis s'en va". Le Monde. France. Retrieved 21 June 2010. ↑ "World Cup 2010: Nicolas Anelka sent home by France Football Federation (FFF)". The Guardian. London. 19 June 2010. Retrieved 19 June 2010. ↑ "Nicolas Anelka sent home after bust-up". BBC Sport. 19 June 2006. Retrieved 19 June 2010. ↑ "French players in revolt after Anelka sent home". CNN. 20 June 2010. ↑ "Nicolas Anelka given 18-match France suspension". BBC Sport. 17 August 2010. Retrieved 17 August 2010. ↑ Carr, Corrina (7 November 2018). "Nicolas Anelka to take up a Lille youth coaching role". Sky Sports. Retrieved 8 December 2018. ↑ "Anelka career stats". Football Database.eu. Retrieved 7 February 2013. ↑ "Anelka British stats". 11v11.com. Retrieved 7 February 2013. ↑ "Anelka French stats". LFP . Retrieved 7 February 2013. ↑ "Anelka Turkey stats". TFF . Retrieved 7 February 2013. ↑ "Anelka Chelsea stats". Bounder.Friardale.co.uk. Retrieved 7 February 2013. ↑ "Anelka UEFA stats". UEFA . Retrieved 7 February 2013. ↑ "Anelka, Nicolas". National Football Teams. Benjamin Strack-Zimmerman. Retrieved 2 January 2012. ↑ "Nicolas Anelka". French Football Federation. Retrieved 24 May 2014. 1 2 3 4 "Nicolas Anelka: Overview". Premier League. Retrieved 15 April 2018. 1 2 3 4 5 6 7 8 9 10 11 "N. Anelka: Summary". Soccerway. Perform Group. Retrieved 15 April 2018. ↑ Garin, Erik; Pierrend, José Luis (18 January 2018). "France – Footballer of the Year". Rec.Sport.Soccer Statistics Foundation. Retrieved 15 April 2018. Wikimedia Commons has media related to Nicolas Anelka .